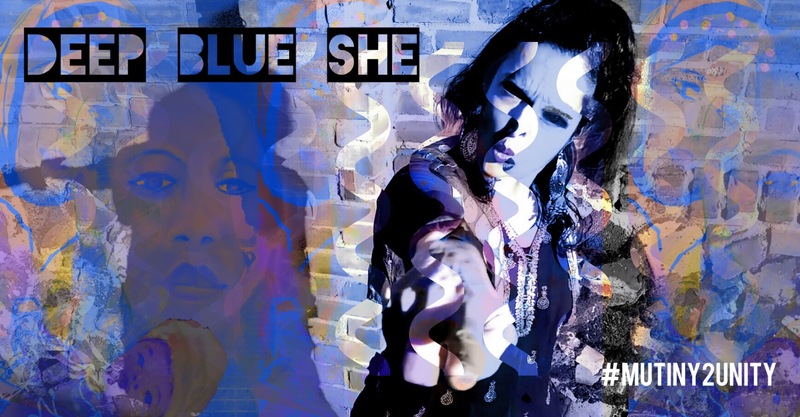 DEEP BLUE SHE (#Mutiny2Unity) is a grassroots/DIY music video/PSA intersectionality project for women’s / human / LGBTQ+ empowerment and racial/gender equality. This song–a female-POV modern-day take on “A Sailor Went to Sea”–was written for these daughters and sons, and all who gloriously inhabit the infinite in-between. Us. DEEP BLUE SHE was selected for the #VogueEmpower playlist for Vogue Fest, Vogue India’s social awareness initiative for women. My intention with it was to write a modern-day female/human empowerment-themed dance track, a kind of call to rise up: to love our daughters more. Raise our sons to lay down swords. Stand up for ourselves and each other. Love who we want to love. Be who we want to be. Make room for and celebrate each other. And create safe spaces for that embrace. East, West: All the world round. All things—necessities–that feel increasingly urgent to counterbalance (and hopefully dissolve, transform) the opposing forces that seem to have flexed in many parts of the world. The winds are changing. And now is not the time to give up, fellow tribespeople/dreamers/doers—but rather, gather our forces for the good fight ahead. Turn that heartbreak to heartmake. We Are Here. And You are You– and that’s muscle, mind, heart, soul…and a very strong, steady light in the darkness indeed, one not to be underestimated. Our hurricane lamps are bright, will not be blown out.